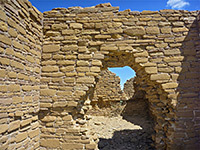 Probably the most popular trail in Chaco Culture National Historical Park is the 5.1 mile Pueblo Alto Loop, or at least the first sections of it, as far as an overlook of Pueblo Bonito (2 mile round trip) or the ancient ruins of Nuevo Alto and adjacent Pueblo Alto (3.2 mile round trip); the outer part of the loop passes less of interest so is rather quieter, though no part of the trail is particularly busy. The hike begins at the parking area for Pueblo del Arroyo beside Chaco Wash, first heading downstream a short distance along an old vehicle track to Kin Kletso, another impressive, well preserved ruin on the valley floor. From here, a path forks north, climbing the cliffs and following the plateau rim for a while then turning away from the canyon, crossing the mesa top to the two ruins, one of which retains relatively tall walls, while the other, although larger, is unexcavated, and has only low remnants. There is not too much see here, but the site is remote, windswept and evocative. The remainder of the loop returns to the canyon edge, giving elevated views of two of Chaco's largest pueblos (Chetro Ketl and Pueblo Bonito). Apart from the initial short climb, the loop is easy, fairly level, though hot and exposed in summer, and the hike takes between two and four hours. The mesa top has a reasonable selection of wildflowers in summer but not quite as many species as on the valley floor. 17 views along the Pueblo Alto Trail. Parking for the hike is at the west end of the park road; most people are here to visit adjacent Pueblo del Arroyo or Kin Kletso a little way further west along the disused vehicle track (formerly the main park entrance route), but this is also the start point for the 3.6 mile Penasco Blanco Trail as well as the Pueblo Alto Trail. 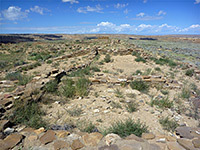 0.3 miles from the trailhead, the first point of interest is Kin Kletso ('yellow house'), a smallish (by Chacoan standards), rectangular pueblo lined by quite high walls at one side, containing five kivas and about 65 rooms, most now ground floor only, though the structure originally had three storys. The masonry is typically neat, and complex, incorporating stones of varying sizes. A path loops all round the site, though no rooms may be entered. The Pueblo Alto Trail forks north on the far side, up a short boulder slope and through a shady, slot-like crevice, which was also used by the ancient tribes, and leads to the canyon rim, 100 feet above the valley floor. 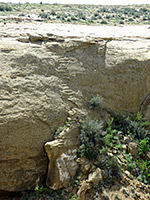 The surroundings are mostly bare surfaces of light brown Cliff House Sandstone, and fairly level, but with slightly higher land visible further north. Kin Kletso looks different when seen from above since the elevation gives a much better overview, allowing the scale and symmetry to be fully appreciated; further along the loop, similar perspectives are provided for two other major ruins (Pueblo Bonito and Chetro Ketl). The cairned path follows close to the rim, moving southeastwards, encountering several notable sites (marked by NPS signs), including a stone circle, an ancient terrace and a collection of shrimp burrows. These are petrified casts; straight, dark-colored, tubular fossils gradually eroding out of the softer bedrock, and can be seen in many locations all the way along the trail, which next winds around a few gullies and reaches a very short spur to an overlook of Pueblo Bonito. Just after this is a junction with the start of the 3.1 mile loop section, the two branches signed 0.6 miles to Pueblo Alto (north) and 0.6 miles to Chetro Ketl Overlook (east). Turning north, the path turns away from the rim, now running over soil rather than rock, up to the top level of the mesa, passing a short section of Chacoan steps and an ancient road fragment, this not much to look at. The land flattens out as the route nears Nuevo Alto, or New Alto, a compact, 32 room, relatively recent (late 12th century) ruin, and Pueblo Alto, 450 feet east. This is much larger - 370 by 250 feet, and has the D shape common to some of the valley floor sites, but here all the walls are very low, and most of the original 130 rooms and 18 kivas are no longer visible. But the views are extensive, especially to the north, where the land slopes down gradually down to the next valley, and it is possible to see many miles over this part of the San Juan basin. On the east side of Pueblo Alto is a fenced-off area, containing an unexcavated midden. 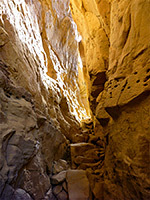 Beyond Pueblo Alto, the path, now somewhat narrower, proceeds southeast over sandy flats and descends a little to within sight of the rim of Chaco Canyon, winding round a wide, sheer-walled basin, one feature here being Jackson Stairway, a series of steps cut in a near vertical rock face. The trail bends southeast again, back towards the main valley, dropping down to the lower plateau level via another narrow crack, then crosses the basin and comes close to the canyon edge. There is one more marked overlook, of Chetro Ketl, before arriving back at the junction, at the start of the loop. From here, the trailhead is 0.8 miles away.